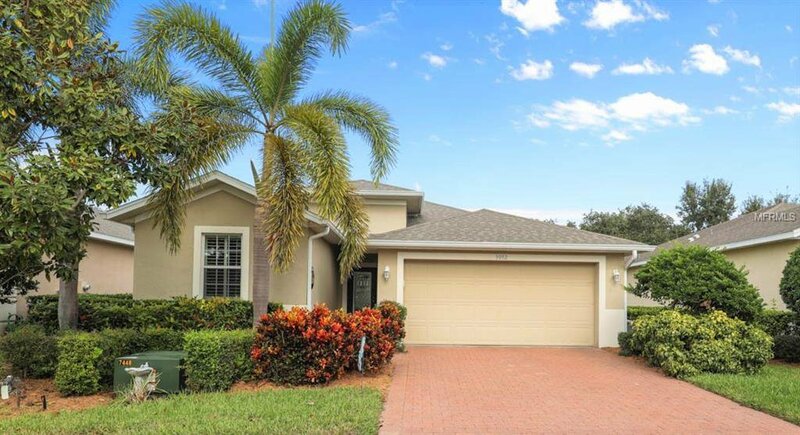 LAKEVIEW, three bedroom, two bath, 2 Car garage with EXTENDED LANAI! Approximately 1.5 MILES TO THE BEACH!! Pennington Place is a friendly, gated community that offers private roads, pool, spa, clubhouse, sidewalks and enough social activities to keep you busy. Like to Kayak? They have a Kayakers Club! Low maintenance paver stone driveway and walkway, high ceilings and OPEN FLOOR PLAN that makes the square footage seem much larger than it is. Crown molding and neutral colors. The kitchen has new GRANITE countertops and backsplash, lots of natural light, PLANTATION SHUTTERS throughout, vertical cellular shade at sliders, 3 new fans, new washer & dryer. You'll find the master suite's size a pleasure with a large walk-in closet and master bath with additional cabinets others don't have with new lights and mirror. The SPLIT PLAN gives privacy for all. No CDD fees here! This is an extremely well maintained home in a PET FRIENDLY community that is close to everything you need.